« BAT for the Jaguar! Should wildlife researchers be allowed to capture Southwest jaguars for study, given the risk of injury or death to the extremely rare animals? After the capture-related death of “Macho B” in Arizona earlier this year, we asked the U.S. Fish & Wildlife Service to suspend its authorization of the activity. We applaud The Arizona Daily Star (Tucson) for questioning the practice, and reporting on other recent research-related deaths of jaguars in nearby Mexico. The capture and handling of Southwest jaguars, a critically endangered species, can be justified only in terms of essential conservation benefits, clearly absent in this case. 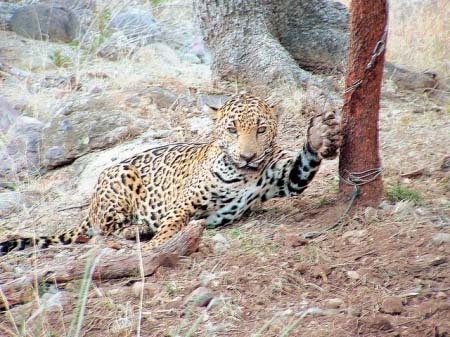 We are requesting written justification from the Service for continuing authorization of jaguar captures (Ltr to USFWS_6-17-09). This entry was posted on June 17, 2009 at 10:34 pm and is filed under HOT SPOTS. You can follow any responses to this entry through the RSS 2.0 feed. You can leave a response, or trackback from your own site.